The Epiphone Genesis is a unique guitar that was first offered in 1979. 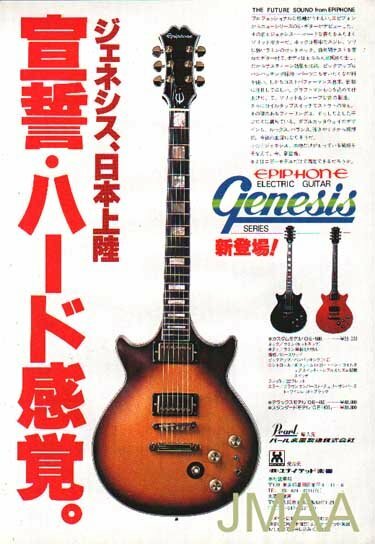 All models of the Epiphone Genesis were all built in Taiwan and were only offered for two years, ending the run in 1981. 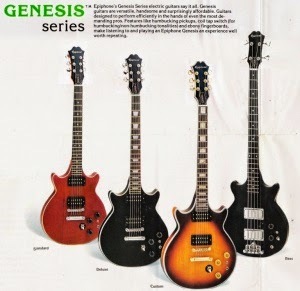 Three models were offered, The Genesis Custom, The Genesis Deluxe and the Genesis Standard. 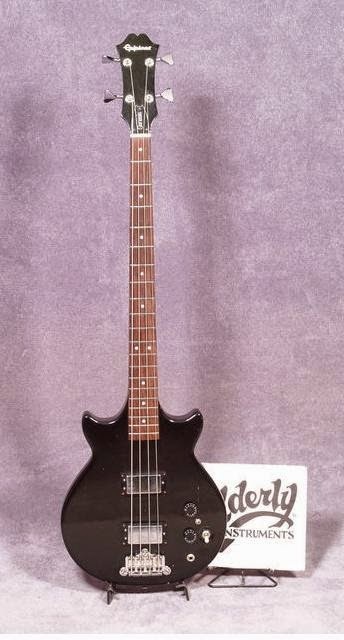 In 1980 a Genesis Student model was in the catalog as was a Genesis Bass, although it is not certain that any student models were every actually manufactured. The Custom and Deluxe models were available with either an Ebony or Dark Sunburst finish. The Custom came with double binding on the neck, triple binding on the headstock and quadruple binding on the body. The rosewood fretboard was dressed with rectangular inlays. All the hardware was gold-plated. It had a crown inlay on the headstock. The Deluxe model came with single ply binding on the neck and headstock and double binding on the guitars body. This guitar featured a crown inlay on the headstock. The Standard model and single ply binding on the guitars body. The neck and headstock were unbound. The rosewood fretboard featured dot inlays. Both the Standard and Deluxe models came with chromed nickel hardware. The Epiphone Genesis Bass was only offered in Ebony. The bass featured two humbucking bass pickups with solid chrome covers; no pole pieces. The chrome bridge was at the bodies distal end. The mahogany neck was topped with a rosewood fretboard that featured dot inlays. The guitar had four chromed nickel tuning keys. There was a single volume and a single tone knob, a pickup selector switch and a mini switch for pickup coil tapping. Most all models included open coil humbucking pickups on black bobbins (except the bass), although some seem to have been offered with pickup covers. The body style with its unusual twin cutaways made these instruments very distinctive. This guitar was designed by Gibson’s then director of marketing Jim Walker and they were built at the same Taiwanese factory that made Pearl Drums. 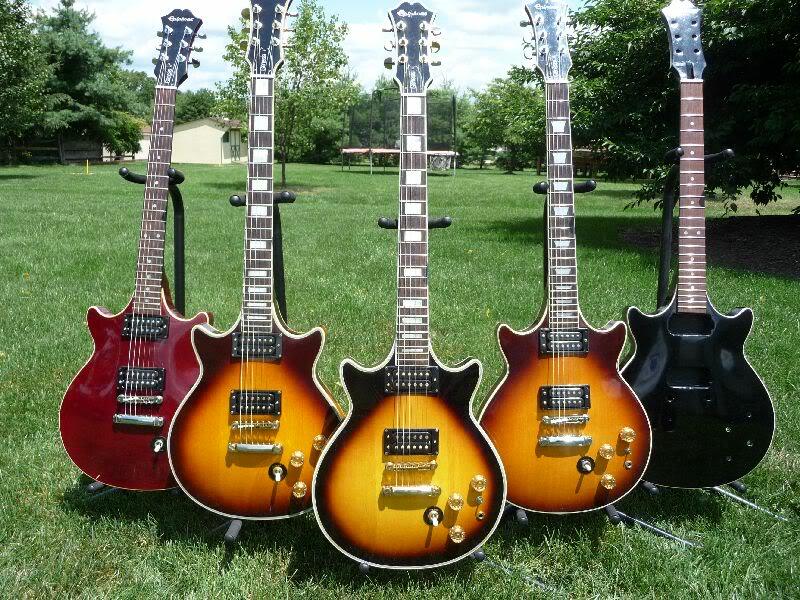 In 2012 Gibson decided to reissue the guitar, but only as a single model. It is still available today and sells for around $425 USD. That is a great price considering that in 1979 the Genesis Custom sold for $399.95 USD. The new guitar, called The Epiphone Genesis Pro feature a solid mahogany body capped with a flame maple top and back. The bound neck is also solid mahogany topped with a rosewood fretboard. The older models came with twin humbucker pickups, two volume and one master tone control and a DPDT switch for coil tapping. The electronics on the new model are different. The headstock on the new model is less pronounced. It features 3 on-a-side tuners. The output jack and the pickup selector switch are mounted towards the distal end of the body. 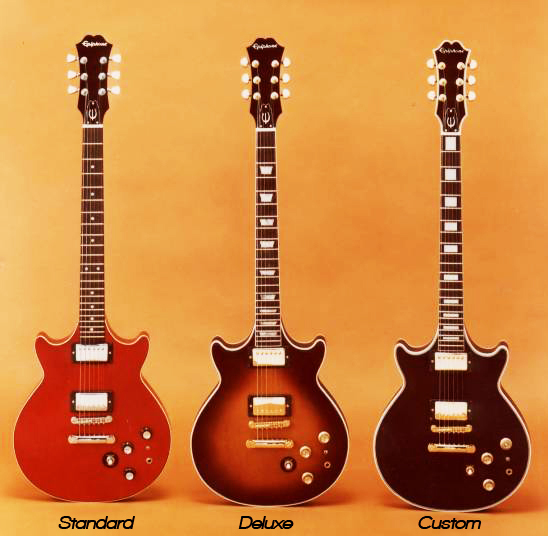 All the Epiphone models featured a tune-o-matic bridge and a stop tailpiece. The modern Genesis guitar features 2 volume and 2 tone controls, the pickup selector switch in a similar location on the guitar’s body. The volume speed knobs have a puch-pull function that activates the pickups coil tapping feature. The pickups on this version are Gibson’s Probucker with Alnico II magnets. The pickup in the bridge position is over-wound to give it some bite. The hardware on the new model is gold-plated. The body and neck have single ply binding. There is no binding on the headstock. Nice post. I like to read your post. 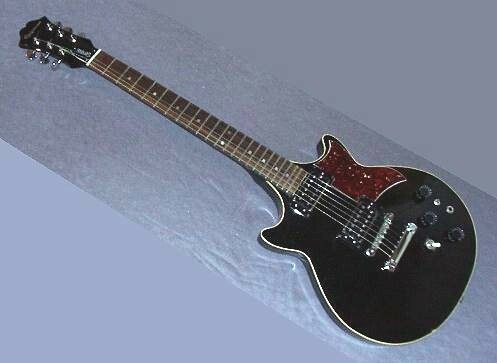 I have bought an epiphone guitar online from Musikshack.com. I got the best quality guitar. You can also try this on http://www.musikshack.com/brand/epiphone Thanks for sharing your post with us.